“Tea is the most popular beverage in the world but the rituals and passion behind its art have been lost along the way. In the western world most people drink tea for convenience. They want it quick and drink it fast; the enjoyment of the brewing process has been lost. The ‘Essence of Tea’ Concept first came to me when I was preparing tea one evening, I realised that the reason I make tea in my own special way is because of the relaxed state it induces. It was from that point that I knew I wanted to create a product that invoked a state of relaxation through the art of tea. I started my process by gaining an understanding of both tea and tea culture in both the modern and traditional worlds. Through field and desk research I discovered that in Britain we don’t really appreciate tea as an art form, no one takes time to enjoy the scents and flavours anymore. This posed the question, why? Early on in the year I established a group of users, people that were interested in the concept and that I could use as constant critics. I ask them as well as many others including the teahouses and cafes in town why they though Britain had this attitude. The results I received from this told me that the public don’t really see tea as anything more than a common pastime. They lacked the confidence and knowledge of how to make tea anything more than just a teabag. As a designer maker I wanted this project to be very hands on crafting experience and to act as a gateway fort me to work in new mediums. As tea is an all-natural product the design language I wanted to implement also had its underlying values in nature. From researching into Chinese tea materials and talking to the university technicians a healthy material balance was met. Red earthenware clay was used to create the teapots in replacement to the Yixing stoneware clay that would be used in the traditional ceremonies. It’s cheaper is similar in appearance and the properties can be easily mimicked by internally glazing the pieces. Each of the tea utensils are hand crafted for bamboo. Bamboo has a high tensile strength which allows for it to be flexible, perfect for making comfortable utensils. The table is built from American white oak and is finished with Chinese Tung oil. The reason I chose white oak is due to its fast growth and dense grain. This means that when subjected to heavy water use the grain will not absorb water as readily and ultimately warp the wood. The Tung oil used to finish the piece allows for a water rejection effect and hence amplifies the effect of the water drainage feature. 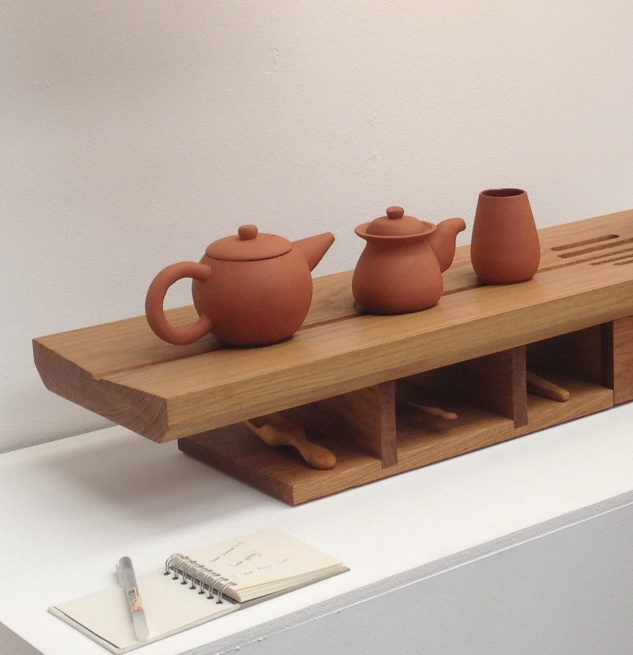 After the completion of my degree, I presented The Essence of Tea at the New Designers showcase held at the Business Design Centre London. This gave me the opportunity to both showcase myself as a newly graduated designer, and to meet new and exciting creative individuals. I received a lot of interest from both designer makers and kitchenware designers, currently working in the creative industry. 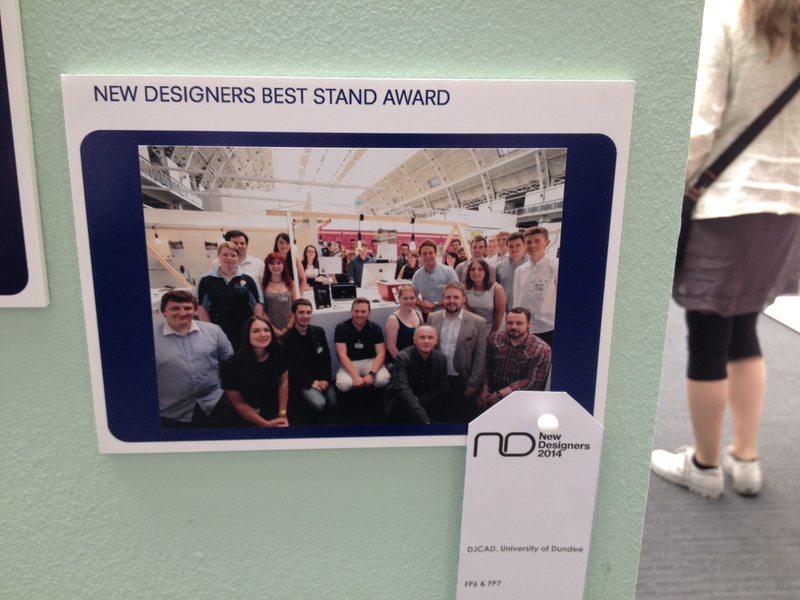 As well as presenting my personal work, as a collective DJCAD unit we won the best stand award. This award detailed us as the most overall effective at presenting our work and attracted many more visitors to our stand.